Spotted bass look so much like their largemouth cousins that it can hard to tell them apart even if right next to each other. Spotted bass, like largemouth, have a black stripe that runs laterally across the sides. However, unlike a largemouth, spotted bass have rows of spots beneath that lateral stripe. Moreover, the back of the mouth does not extend past the eye, and they have a patch of small teeth on their tongues that largemouths lack. 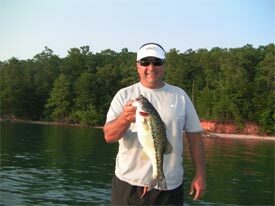 Spotted bass are lighter in color than smallmouths, often more green and olive colored than bronze. Native to both the Ohio and Mississippi River basin, across the Gulf states from Texas to east Florida and surrounding states. The spotted bass has been introduced in several states elsewhere, including North Carolina, Virginia, and California. Relatively deep pools in medium to large streams and rivers. Spotted bass enjoy faster-flowing current than largemouths, typically avoiding still waters with lots of vegetation. Crayfish and aquatic insects predominately, but will also feed on small fish and flying insects that land on the water. Spotted bass spawn between April and June, doing so in deeper water than both largemouth and smallies, sometimes as deep as 40 feet. Females lay between 1,100 and 47,000 eggs. Males guard the eggs and fry for a short time after they hatch.